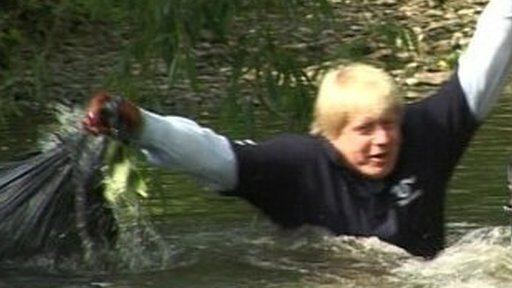 The Mayor of London Boris Johnson has fallen into a river while launching a drive to urge Londoners to volunteer. While helping to clear up the River Pool in Lewisham, south-east London, he tripped and fell in, getting wet up to his chest before stumbling away. Mr Johnson, who was helping remove litter and plants from the river, was aided to his feet by volunteers - one of whom jumped in after him. He described his unexpected dip as "the ultimate sacrifice". Mr Johnson said: "We have been out and about in London to discover the joys of volunteering. "I think it is a fantastic thing to clean up our rivers. "And of course in order to promote this to the max, I made the ultimate sacrifice - I decided to fall in, in a very spectacular way." Mr Johnson and members of the Quaggy Waterways Action Group, were removing litter and Himalayan balsam, an invasive plant species that prevents native vegetation and wildlife from thriving. There are more than 8,500 volunteer organisations registered with London's network of volunteer centres - they estimate an additional 16,000 people sign up each year. Mr Johnson earlier said: "Volunteering is good for individuals and great for London in tough economic times. "By giving your time, whether a one-off few hours or a regular commitment, we can both help to make the capital a more civilised, pleasant place and reap the rewards of putting something back into the communities in which we live." After the river clean-up the mayor launched a website containing a one-stop-shop of opportunities to give their help for free.